Would you like help finding the right products for your company? We're here to guide you towards the perfect solution. Simply contact Konftel India. And have you tried our usefulProducts? Konftel Cam20 is a plug-and-play 4k camera for video conferencing. Cam20 connects via USB, making it easy to get professional video quality for your communications. You can also connect Cam20 using HDMI. 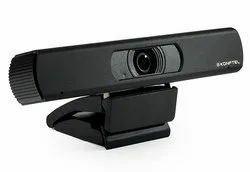 It supports simultaneous USB and HDMI signal output, so you can, for example, connect the camera directly to a secondary display to show your end of the conversation. Cam20 works with a huge range of video conferencing services, including WebEx, Zoom, BlueJeans, GoToMeeting, and Skype for Business. Fit for midsize rooms with groups of up to 12 people, Konftel Cam20 features electronic pan-tilt-zoom technology, including 8x digital zoom. The wide-angle lens gives you a 105° field of view, so it's suitable for more constrained spaces. It has WDR technology, which automatically adapts to lighting conditions to give you the best picture. Control the camera using the included remote control. Konftel Cam50 is an exceptional PTZ video conferencing camera for large conference rooms. Fit for groups of up to 20 people, Cam50 offers 12x lossless optical zoom to go with a 170° panning range and 60° tilting range. It takes highly detailed 1080p Full HD video, so the faces are all clear and crisp. Automatic image quality optimization makes sure your picture is correct, even in low light. Konftel Cam50 is a plug-and-play solution for professional video conferencing. Just connect it using USB or HDMI. Cam50 is compatible with an extensive range of apps and cloud video services, including Zoom, WebEx, Skype for Business, Microsoft Teams, GoToMeeting, and BlueJeans. 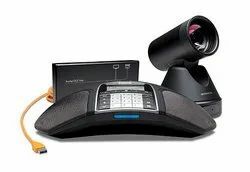 Konftel C20Ego is an all-in-one bundle for video conferencing in the huddle room. C20Ego consists of Konftel speakerphone, Konftel camera, and Hub. Konftel Speakerphone is a small and portable speakerphone for professional group communications for up to 6 people wherever you are. Compact and simple to use, Ego includes Konftel OmniSound with HD audio and 360° voice pickup. Connect to either USB or Bluetooth. Compatible with Skype for Business, BlueJeans, Zoom, Cisco Webex, GoToMeeting and ect. Konftel Cam is a 4k video conferencing camera. 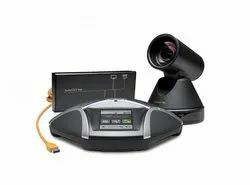 A professional USB camera, features 8x digital zoom and a wide-angle 105° field of view, perfect for the huddle room. Konftel OCC Hub connects your devices and the monitor to a computer. Plug your camera and speakerphone using USB and an HD display using HDMI into the Hub. OCC stands for One Cable Connection, which means that you only need to run one USB cable to connect it to a computer. Konftel C2055 is a video conferencing solution for groups of up to 12 people. C2055 is designed for midsize conferencing spaces, including conference rooms, board rooms, and general purpose rooms. Konftel C2055 consists of a Konftel speakerphone, Konftel camera, and USB conference station that gives you OmniSound HD audio with 360° audio pick-up. It can be used with PC, smartphone, tablet, or deskphone (with adapter), and you can store calls on an SD card. Konftel Camera is a professional USB camera with 4k resolution. features 8x digital zoom and a wide-angle 105° field of view, perfect for capturing the faces in the conference. connects speakerphone, camera, and display to a computer. OCC stands for One Cable Connection. Only one USB cable from the hub connects to a computer. The camera and speakerphone are plugged into the hub using USB and it connects to an HD display using HDMI. Konftel C5055Wx is an exceptional PTZ video conferencing camera for large conference rooms. Fit for groups of up to 20 people, offers 12x lossless optical zoom to go with a 170° panning range and 60° tilting range. It takes highly detailed 1080p Full HD video, so the faces are all clear and crisp. Automatic image quality optimization makes sure your picture is correct, even in low light. Konftel C5055 is a plug-and-play solution for professional video conferencing. Just connect it using USB or HDMI. Compatible with an extensive range of apps and cloud video services, including Zoom, WebEx, Skype for Business, Microsoft Teams, GoToMeeting, and BlueJeans. Konftel C50300 is an exceptional PTZ video conferencing camera for large conference rooms. Fit for groups of up to 20 people, offers 12x lossless optical zoom to go with a 170° panning range and 60° tilting range. It takes highly detailed 1080p Full HD video, so the faces are all clear and crisp. Automatic image quality optimization makes sure your picture is correct, even in low light. Konftel C50300 is a plug-and-play solution for professional video conferencing. Just connect it using USB or HDMI. C50300 is compatible with an extensive range of apps and cloud video services, including Zoom, WebEx, Skype for Business, Microsoft Teams, GoToMeeting, and BlueJeans.